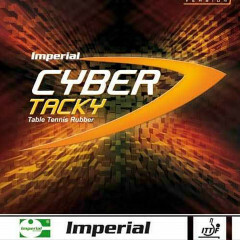 Imperial high-tech rubber "Cyber Tacky" is a special development for allround/offensive players, looking for an excellent touch, best control and a lot of spin. The rubber is a combination of high quality Japanese sponge and a very tacky, soft and super elastic top sheet. Available in three Japanese sponges with different hardness to find the best one for an individual strategy." Imperial Rubber Cyber Tacky Japan Medium Hard is beeing added to cart.